As another school year begins, let’s pause to consider one experience that’s almost certain to make school a better place: making music. Singing as a group is an awesome way to build school community and empower children to do good in the world. While I love it when classes sing my original songs, I’m also an advocate for classic children’s tunes of the “Old MacDonald” variety. Well-known songs offer tried-and-true opportunities for classes to develop their singing repertoire. While usually a music specialist sees the children only once per week (if that often), introducing traditional songs into the mix can provide incentive for classroom teachers to continue singing the familiar songs with their students. My work as a music specialist is primarily with early childhood (ages 2-6), but this post applies to teachers of kids of any age. Wouldn’t middle schoolers love a singing break? Some classroom teachers love singing, while others may be more reluctant. Make a list of songs the teachers likely already know and encourage them to lead a few songs each day during class meeting times. 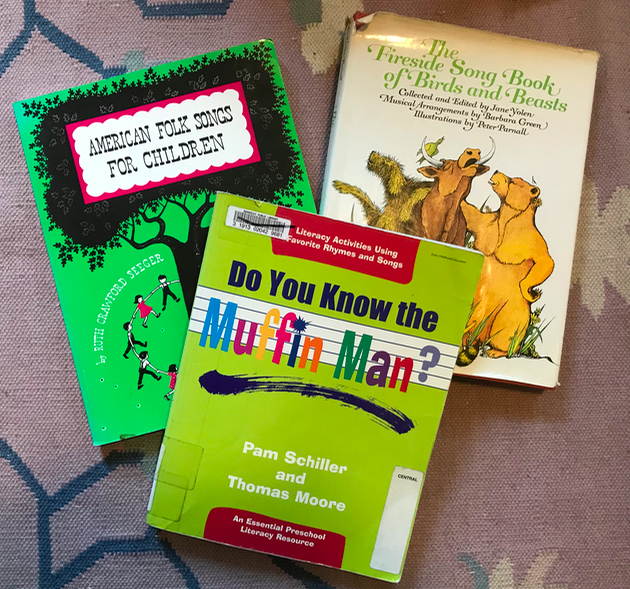 But don’t neglect these songs during music class; children enjoy hearing and participating in the familiar songs with instrumental accompaniment. It gives them a feeling of confidence to enjoy singing a song they know well. 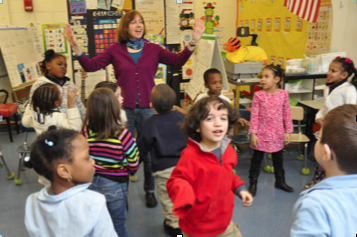 Preschool children may seem shy about singing. Not every song in music class needs to be a sing-along song, but one of the hallmarks of any music program should be teaching children to sing confidently and on pitch. They can do it! For younger kids, nursery songs are a great place to start. You may feel Old MacDonald is “old hat,” but it’s new to the kids. They are quickly engaged on the animal sounds and the “Ee-i-oh” refrain. Most children also likely know “A-B-C” and “Twinkle Twinkle” before you arrive, and Spanish-speaking children often can sing at least the first verse of “Los Pollitos.” Give them a chance to demonstrate their singing ability! When teaching new songs to children, choose songs that are repetitive and simple. If a song has too many lyrics, most young children will get lost. If you want to feature a longer song, it helps to focus just on the chorus or a single verse, with older kids and the music teacher taking on additional verses. Children aged 2-6 may seem quiet at first, but they can be awesome singers. Be patient and choose age-appropriate songs. Call-and-response songs are an ideal choice for getting kids to start singing, but don’t limit the repertoire to those. Teaching even a simple song requires several repetitions during a single lesson and returning to it over the course of several lessons. When teaching a song, first sing the whole song to the kids. Show strong enthusiasm for the song! The kids will be excited to learn it if you model that excitement. Sing the song again line by line, having the children repeat it after you. Take time to focus on matching pitch, having children echo your voice on a single phrase. Do pitch-matching in small groups, perhaps splitting the group into two or three sections and asking each one to repeat the phrase. This can help you see who’s singing well. If a song has multiple similar verses, such as my version of “The Muffin Man,” get kids singing the first verse and the additional verses often easily follow. Songs with hand motions or gross-motor movement patterns can help children learn lyrics, but not every repertoire song needs to have motions. An instrument part can add interest to the song, but wait until children know the song well. This ought to go without saying, but be sure every music class includes several songs the kids feel comfortable singing! Next post: My list of classic songs for kids. I agree! Great blog Liz!